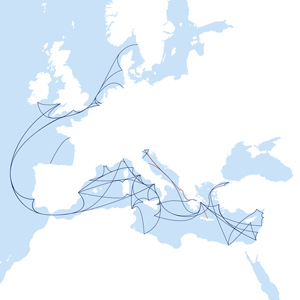 The concept of linking a number of peripheral areas in Europe by means of a direct and regular Ro/Ro Multipurpose Car Carrier liner service was, in the mid-90s, the basis for the birth of the Euro-Med Network. Over the years, the Euro-Med has become a tool strengthening the economic cohesion of many European and neighbouring countries and proved to be a veritable conveyor belt serving the industrial production system in Scandinavia, Northern Europe, the British Isles and the Mediterranean. In less than a decade its success in attracting traffic both northbound and southbound has been such that it has developed into a fully-fledged network, made up of a range of services that complement each other: the Euro-Med, the Euro Aegean, the West East Med and the Adriatic Service. Additionally, it relies on the Mediterranean Short Sea Network to serve destinations it does not call at directly. Following the acquisition by the Grimaldi Group of Finnlines, Euro-Med customers are in a position to benefit from the network of ports served in the North Sea and the Baltic Regions, including Russia. A new weekly BalticEuroMed Service links Finnlines' Scandinavian Service and Grimaldi Lines' Euro-Med Network at the Belgian port of Antwerp. This service allows Finnlines and Grimaldi Lines to offer their customers routes calling at more than 65 destinations and nearly all Europe's coastal countries, from the South East (Turkey), to the North East (Russia) with extensions to countries along the northern coast of Africa and the Middle East such as Egypt, Israel, Syria, Lebanon, Libya and Tunisia. There are about 35 ships operating on the Euro-Med Network, with nearly 40 ports served: stopovers are every two days at the main ports and once a week at the others. This high frequency and the size, unprecedented for the North Europe / Mediterranean trade, of the Ro/Ro-Multipurpose Car Carrier ships deployed on the line are two of the reasons for the success of the Euro-Med Network. In fact, each vessel is capable of transporting up to 4,600 cars or a cargo mix of cars, 3,000 linear metres of rolling cargo, 800 TEU of containers as well as special cargo of up to 200 tonnes apiece. The sector benefiting the most from such a powerful logistics tool is indeed the automotive industry: in 2009 some 1.9 million cars and vans produced in Belgium, Poland, Sweden, Germany, France, Portugal, the UK, Spain, Italy and Turkey were in fact transported through the network to their destination markets. In the same year the Euro-Med Network also moved 300,000 FEU units of Ro/Ro cargo (trucks, excavators, etc) and containers. Shipment examples include the new underground trains of Madrid and Rome; the rolling stock for the tram services in Athens and Jerusalem; entire windmills; or simply consumer goods in containers. The Euro-Med contribution to ease Europe's traffic congestion is therefore evident.